NYXL support player Sung-hyeon “JJonak” Bang is a monster. 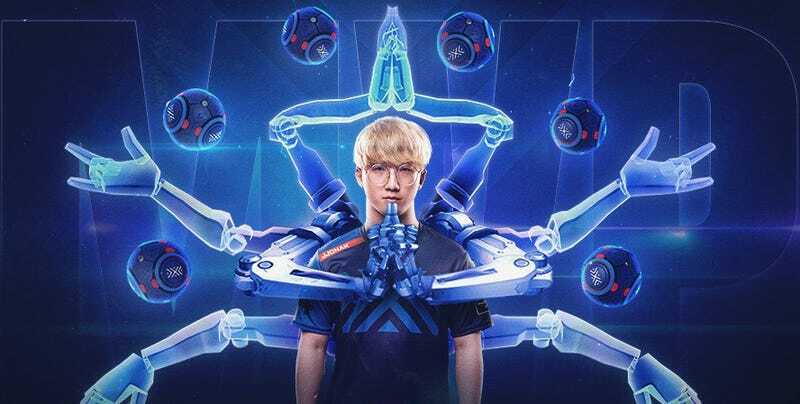 He came out of nowhere during Overwatch League’s inaugural season and single-handedly redefined the way people perceive peace-loving robo-monk Zenyatta, transforming him into a lightning-handed murder machine. The league has just awarded him as its first-ever “MVP,” but what’s weird is, we haven’t seen him play as much as many other players. Game footage from JJonak’s point of view appears in broadcasts far more than other support players in the league. But that is an extremely low bar to clear, given that supports like Zenyatta and Mercy rarely get much airtime at all. JJonak stands out because he’s the rare support who can double as a DPS, and damage-dealing characters tend to get showcased a lot during game broadcasts. Unlike most other support players, JJonak often snags just as many—and on some occasions, more—eliminations than his teammates. When he pops off and orb-literates everyone, it’s camera-friendly. In some cases, though, we don’t actually see JJonak popping off right when it happens. The broadcasters don’t keep the camera on him as often as they do with DPS players, but if the commentators see a spike of activity from JJonak in the killfeed, they’ll jump to a replay from his point of view. I love watching JJonak pick apart the enemy team with well-placed orbs. Maybe he could’ve been a major league pitcher in another life. Still, focusing on these flashy killstreaks deprives viewers of the larger context. Sometimes, commentators briefly explain how JJonak or his teammates set up his big moments, but we rarely see that setup. We’re often left to wonder how he made it all happen. What was his positioning and meter management like, leading up to that wild flank? How did he avoid dying? How the dang heck did he do it with Zenyatta, of all characters? It’s preposterous that these kinds of questions still surround Overwatch League’s undisputed Zenyatta god-king. One could argue that this restraint allows JJonak and other supports to seem all the more mysterious, but at the same time, it downplays the value of what support players can do. The other healers who play defensively rather than aggressively get showcased far less. The league’s commentators and camera crew are keenly aware of JJonak’s reputation, so he gets more love than most. Meanwhile, other top-tier Zenyattas like Unkoe and Bdosin languish off-screen, their points of view relegated almost exclusively to replays in some matches. That’s to say nothing of Mercy players, whose points of view we basically never see, unless they make an absolutely crucial play or whip out their pistol and demolish a Pharah. It’s an understandable dilemma. Esports need to be watchable, and DPS players put on flashy performances, hacking through enemy backlines with glow-in-the-dark cyber swords and clicking heads with superhuman accuracy. A character pulling off a long killstreak is also something that tends to be easy to visually parse, even for newcomers. Supports, on the other hand, spend a lot of time tending to wounded allies and re-positioning to help set up big plays. They’re not exactly thrill-a-minute viewing. But amongst all of Overwatch’s chaos, supports are the glue that holds teams together. They’re playing at astoundingly high levels too, and the league needs to figure out a better way to showcase that—and not just when Zenyatta players decide to briefly transform into golden DPS war gods. Some fans have suggested viewer-controlled, player-specific camera options which would allow audiences to, for example, focus on supports’ POVs. Fans thought they’d be getting this option as part of Twitch’s $30 All Access Pass, but instead, the pass just gives you two team-focused points of view instead of one. Bummer. Even if toggling player POVs does become an option, though, it won’t alleviate the problem of supports getting underappreciated in the Overwatch League. It’s up to broadcasters and commentators to highlight and better explain how complicated and tactical support decision-making processes can be. It’s also on Overwatch’s developers to create support abilities that encourage compelling tactical play and are flashy in their own right—rather than attaching support abilities to kits where DPS abilities mostly hog the spotlight (see: Brigitte, whose armoring abilities barely register compared to her knockback-inducing big, powerful flail strikes and bashes). I’m glad JJonak is OWL’s first MVP, and it’s to the league’s credit that fans seem to be in near-unanimous agreement that he deserves it. But the league could be doing a much better job of showcasing supports overall, and I hope it focuses on DPS-ing down this problem in the future. Overwatch Star Has Advice For Mercy Players: "Be Selfish"